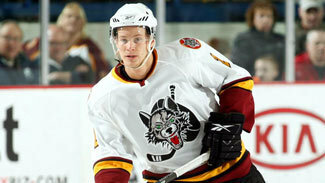 When Chicago Wolves defenseman Paul Postma is done with his hockey career, it's quite possible that he'll look back at the spring of 2010 as a major turning point in his fortunes. Not because of any milestones, awards, or championships, but rather a postseason benching which jarred him into accepting what it truly takes for a player like himself to succeed in pro hockey. A native of Red Deer, Alta., Postma broke into hockey playing forward as a kid and never lost his offensive instincts after a summer-league coach switched him to defense around age 11. He relishes the chance to jump up and contribute to a team's goal-scoring abilities, and for a period of time, that approach paid huge dividends. Postma was drafted by the Atlanta Thrashers in 2007, and after having spent two years with the Western Hockey League's Swift Current Broncos, he was traded to the Calgary Hitmen for the 2007-08 campaign. "They had a lot of faith in me, played me a ton, and kind of gave me the green light to go (up ice) whenever I wanted," Postma said. "Once that happened, I started putting up some points and played a big role on those teams." Possessing both the talents to produce offensively and the blessing of his coaches, Postma put up 42 points for the Hitmen in 2007-08 before erupting for a 23-goal, 84-point season in 2008-09 which made him the WHL's highest-scoring defenseman by a 17-point margin. As far as confidence goes, quite a way to wrap up your junior career and prepare for the pros. "I've always tried to be offensive, but I never really learned my full capability until that year, just a heck of a year," he said. "I definitely went into my first year with a lot of confidence." Postma began his AHL career in Chicago last year and things started well enough, as he collected three points his fourth game and registered five other multi-point efforts on the season, including a hat trick in February. He ended up with 29 points (15-14-29) in 63 regular-season contests. But there were some warning signs along the way. Despite his offensive contributions, the 6-foot-3, 190-pound defenseman had a negative plus/minus rating in nine of his first 11 games and ended the year with a minus-7 showing in five April outings. "I think the transition took a little longer than I expected," Postma said. "It's actually quite tough -- guys being faster and stronger. My offensive game was OK last year, but I struggled defensively with little things like one-on-one battles and battling in front of the net." The struggles in his defensive zone cropped up often during the regular season, but Postma's offensive contributions were largely able to offset them. Once the division-champion Wolves arrived in the Calder Cup Playoffs and Postma was still having trouble, though, Chicago head coach Don Lever decided to make a bold move with his rookie. 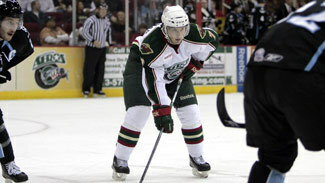 After recording 2 assists, but also a minus-3 rating while playing six of the seven games in the opening round vs. Milwaukee, Postma was shipped to the press box after Game 1 of the Wolves' second-round playoff series against the Texas Stars. "Last year, we didn't play him in the playoffs because he wasn't good enough defensively," Lever said. "I think that sent a big message to him." "He played the first couple games and he was minus in both games, and obviously at that point you're trying to win and teach at the same time. I think it was a valuable lesson to him that when push comes to shove, defense wins." For Postma, who had progressed this far based on his offensive touch, it was a statement that being strong at one end of the ice simply isn't good enough. After the Wolves were eliminated by Texas in seven games, Postma made it clear to his bosses that the message had been received. "We had meetings last year when we got beat out, and I told the coach that I never, ever want that to happen again, and I'm going to do everything in my power to make sure it doesn't," Postma said. "I'm going to battle for my spot and compete every night. It did take a while, and those healthy scratches were definitely a wake-up call. "I definitely left a little frustrated not having played in the second round. I think I took that into the gym and sort of let off some steam with my summer workouts, and I wanted to come back with a vengeance." Lever, who won a Calder Cup with Hamilton in 2007 after spending 14 years in the NHL as a player and another 14 as an assistant coach, has been around the game long enough to recognize how to both employ Postma's strengths and identify and correct his weaknesses. "His offensive abilities are number one. He's got the big shot, a very good first pass, and he's very offensive-minded," Lever said, noting that Postma is one of the key cogs on a Wolves power play which ranks third in the AHL with a 20.8 percent conversion rate. "I think he was allowed to freewheel in junior -- it probably didn't hurt him, probably helped his offensive abilities -- but to play in the National Hockey League, you're a defenseman, and that means you have to be able to defend." The 22-year-old Postma has continued to be a force offensively this season, already blowing past his rookie-year total with 44 points (12-32-44) -- 26 of which have come on the power play -- and representing Chicago at the 2011 AHL All-Star Classic. But what doesn't always show up on the stat sheet is the progress he's making defensively. After last spring's experience, Postma made it a priority to get better on his side of the red line. "Honestly it's taken me probably a year and a half, but just recently I've finally kind of figured out how I need to play to be successful in my own end here," Postma said. "Part of that is being more patient, but also playing with a little chip on my shoulder, a little more grit, and making sure I don't lose those one-on-one battles." There's also one other indication that progress is being made. "Well, I get yelled at a lot less," he said with a laugh. "I think (the coaches) have a lot more faith in me this year." "He's willing to pay the price offensively and do what it takes to score goals," Lever said, "but defensively he's had a lot of work to do and he's definitely improved in that area. He's competing much more down low and getting better one-on-one. It's day and night in terms of how he competes in his own end." Postma has appeared in 68 of Chicago's 71 games to date, missing two in February for his first NHL call-up to Atlanta and another in early March when he finally got into the Thrashers' lineup and made his NHL debut on Mar. 9. Of course, the end goal is to achieve a more permanent spot on the Atlanta blue line, and Postma's coach acknowledges the growing pains but views him as well on his way. "I think he'll be a shoo-in. It's very tough for a young defenseman, but he's developed very nicely," Lever said. "He's got two areas that he needs to work on -- one is getting stronger, and two is still his defensive play, but he has that wonderful talent of being able to move the puck, which is a small minority of guys." Despite the topsy-turvy beginning to his professional career, Postma hasn't lost the ability to put his situation in perspective. "Everything comes in steps. I struggled when I first entered the Western Hockey League and then took it to a whole new level, and I hope to do the same at this level," he said. "Last year was OK, this year has been a little better in the American League, and hopefully next year I just continue to get better. I don't know when, but hopefully sometime soon I'll be in Atlanta and build off it from there." And no matter how this season ends, Postma is looking forward to this coming summer when his older sister, Alissa, will marry his current teammate and roommate, defenseman Noah Welch. That set of circumstances is unique enough as it is, let alone the fact that it was Postma himself who first helped bring this union about last season. "I got to know (Welch) pretty well last year when he came to Chicago," he said. "He's just an awesome, awesome guy, someone you can trust around family members. I just mentioned to my sister that I have someone for you to meet, and I guess if anything, you can just be friends. When she flew down at Christmas, they hung out a little bit and ended up hitting it off." Several months later, the couple was engaged. So, any thoughts on getting Welch to repay the favor? "It's kind of a joke, but it's funny -- if we're out somewhere and I see a girl I like, he's pretty quick to go talk to her for me," Postma said. "I'll always have that in my back pocket." And as for the back of his head, Postma will always carry the memory of his postseason sit-down if he ever needs to drum up any extra self-motivation. Not a bad pair of cards to play.